The DST (decision support tool), developed in Rejuvenate1, is a series of procedures to guide decision making for a feasibility study considering biomass re-use for a particular area of land. The procedure starts with an explicit statement by the feasibility study team of their objectives for the marginal land in question, including any constraints, for example that off site biomass re-use only is to be considered. 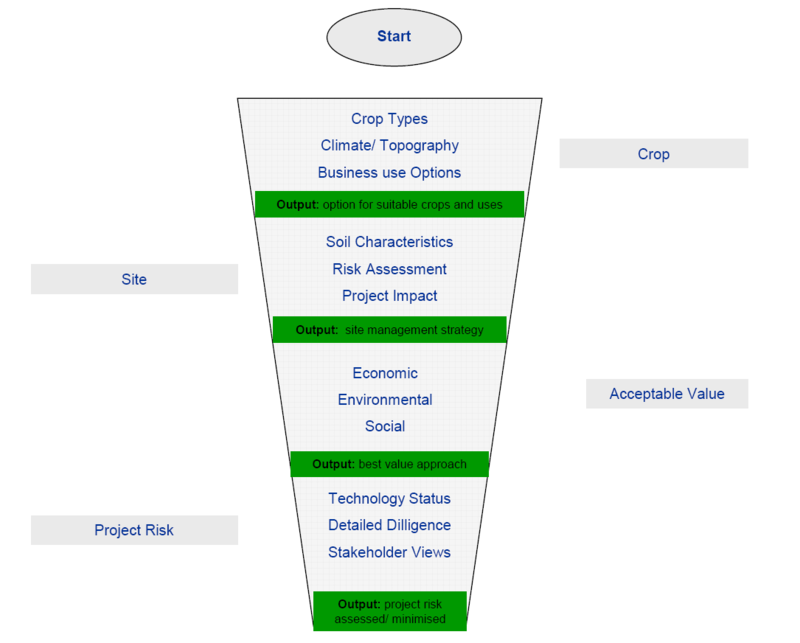 It then proceeds through four stages considering (1) the biomass crop, (2) the site, (3) the project value and (4) the project risks to identify viable project opportunities. It uses a simple traffic light concept to describe the outcomes for project options at each stage. The framework of the DST is shown in Figure 1 and further details are presented in Rejuvenate Consortium (2009). The DST is at present being evaluated in Rejuvenate2 and will undergo a SWOT (Strength, Weakness, Opportunity and Threat) analysis. The DST will be updated based on the forthcoming results from all demonstration sites. It will also take account of including a review of the legal framework at a European scale and pilot site environmental and risk assessments, including Triad analysis of a pilot site. Figure 1. Framework of the DST (click on image to enlarge).